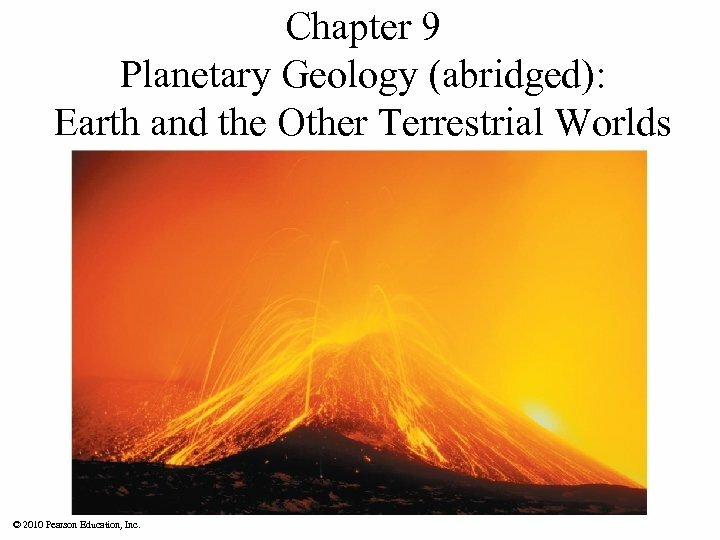 Chapter 9 Planetary Geology (abridged): Earth and the Other Terrestrial Worlds © 2010 Pearson Education, Inc.
9. 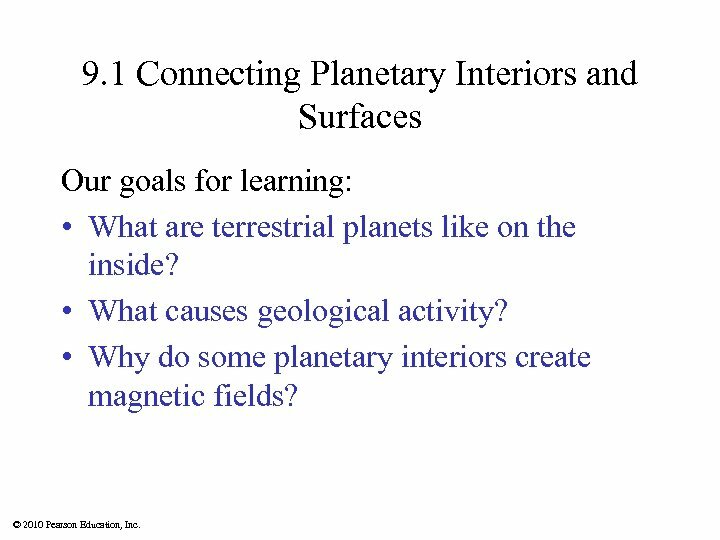 1 Connecting Planetary Interiors and Surfaces Our goals for learning: • What are terrestrial planets like on the inside? • What causes geological activity? • Why do some planetary interiors create magnetic fields? 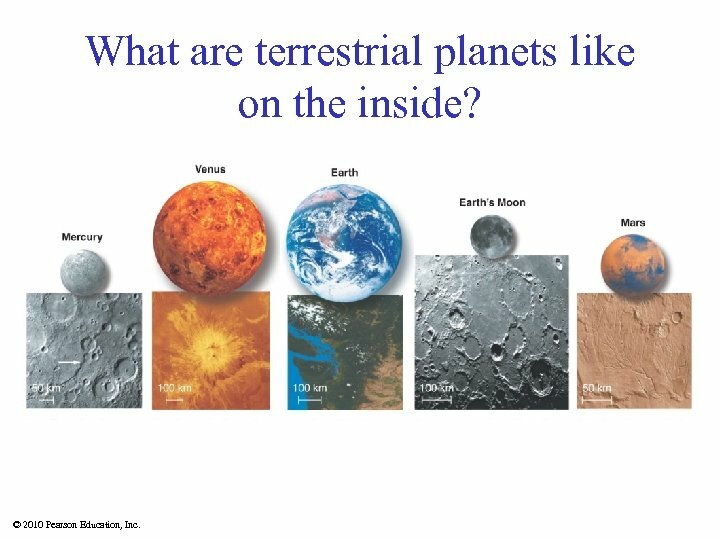 © 2010 Pearson Education, Inc.
What are terrestrial planets like on the inside? 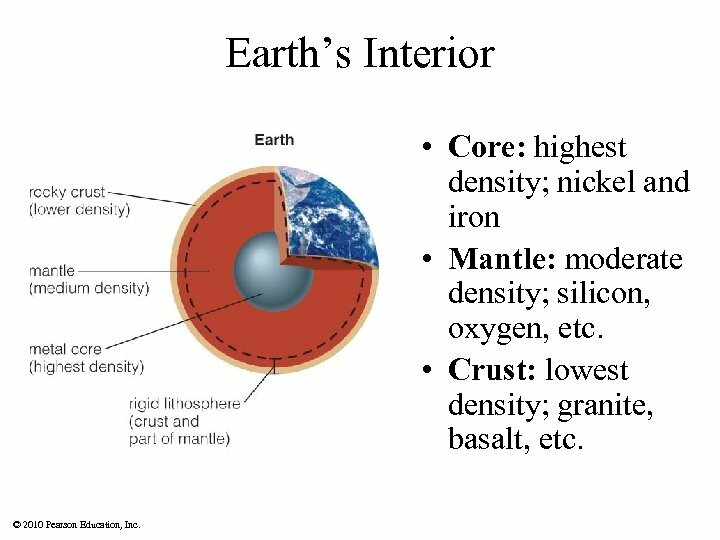 © 2010 Pearson Education, Inc.
Earth’s Interior • Core: highest density; nickel and iron • Mantle: moderate density; silicon, oxygen, etc. • Crust: lowest density; granite, basalt, etc. 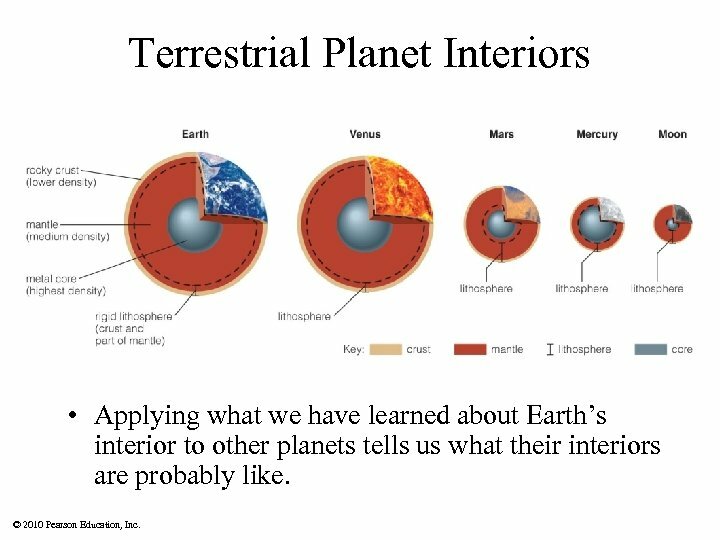 © 2010 Pearson Education, Inc.
Terrestrial Planet Interiors • Applying what we have learned about Earth’s interior to other planets tells us what their interiors are probably like. 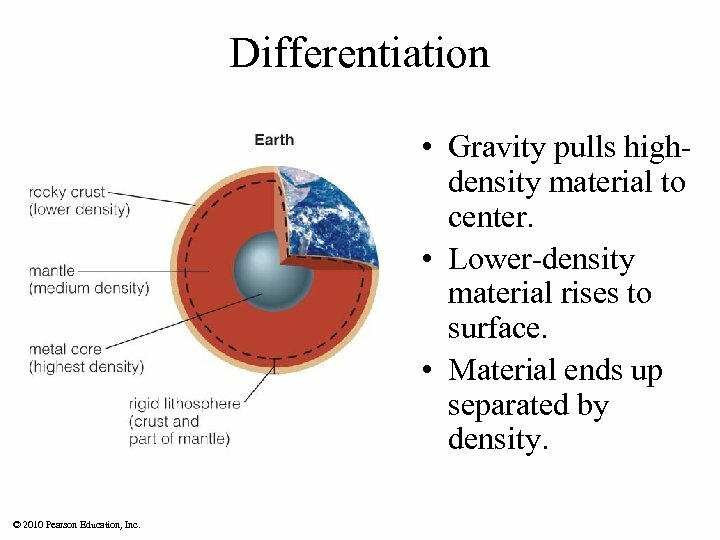 © 2010 Pearson Education, Inc.
Differentiation • Gravity pulls highdensity material to center. • Lower-density material rises to surface. • Material ends up separated by density. © 2010 Pearson Education, Inc. 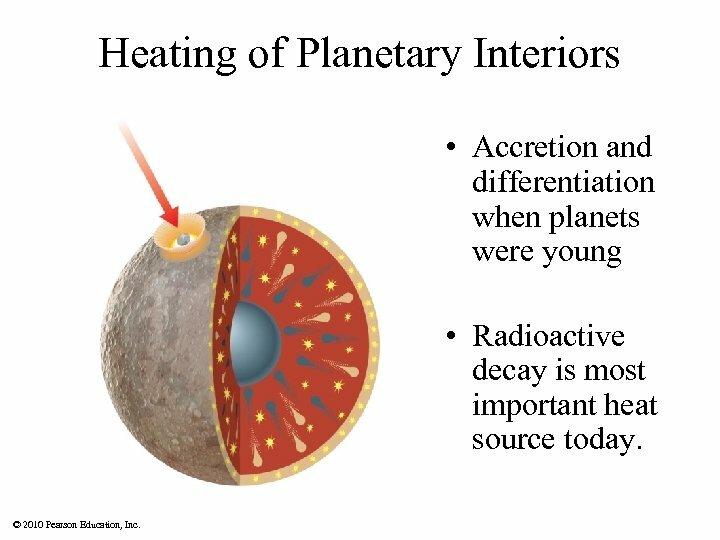 Heating of Planetary Interiors • Accretion and differentiation when planets were young • Radioactive decay is most important heat source today. 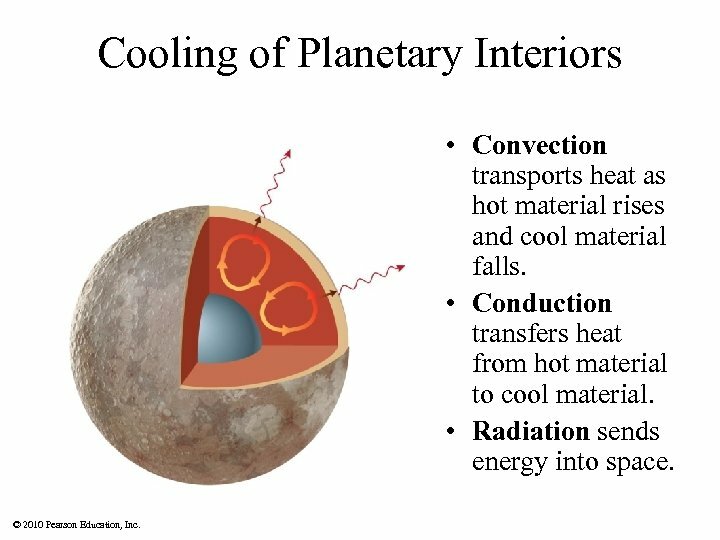 © 2010 Pearson Education, Inc.
Cooling of Planetary Interiors • Convection transports heat as hot material rises and cool material falls. • Conduction transfers heat from hot material to cool material. • Radiation sends energy into space. © 2010 Pearson Education, Inc.
Role of Size • Smaller worlds cool off faster and harden earlier. • The Moon and Mercury are now geologically “dead. ” © 2010 Pearson Education, Inc. 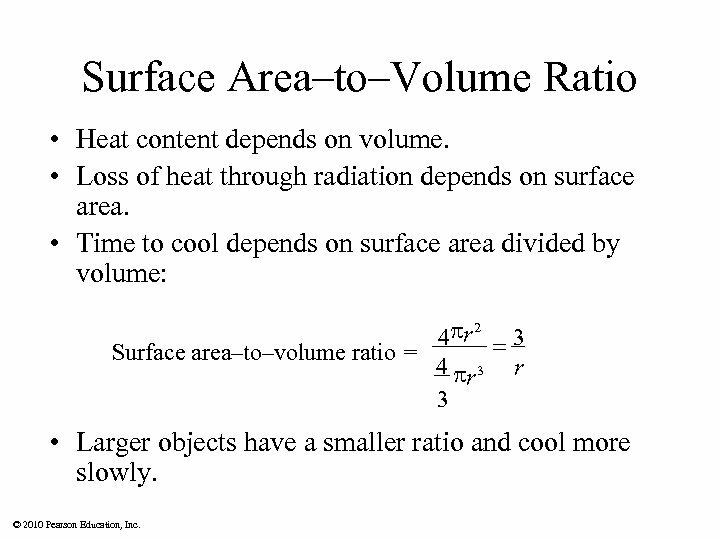 Surface Area–to–Volume Ratio • Heat content depends on volume. • Loss of heat through radiation depends on surface area. • Time to cool depends on surface area divided by volume: pr 2 3 4 = Surface area–to–volume ratio = 4 pr 3 • Larger objects have a smaller ratio and cool more slowly. © 2010 Pearson Education, Inc.
9. 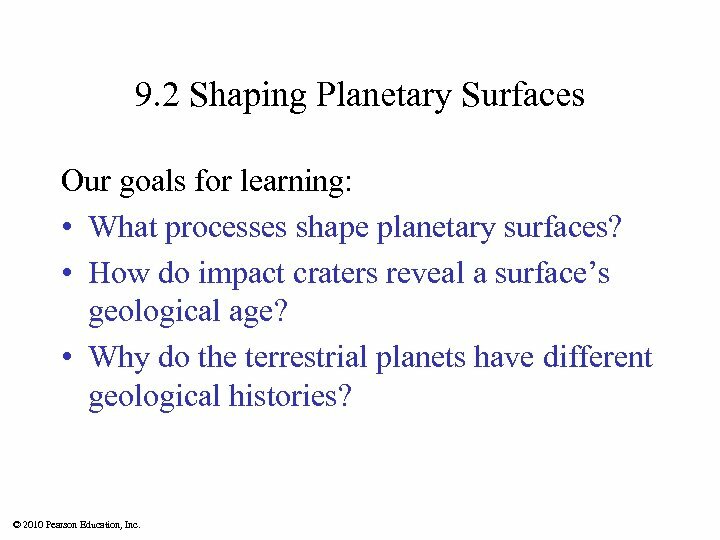 2 Shaping Planetary Surfaces Our goals for learning: • What processes shape planetary surfaces? 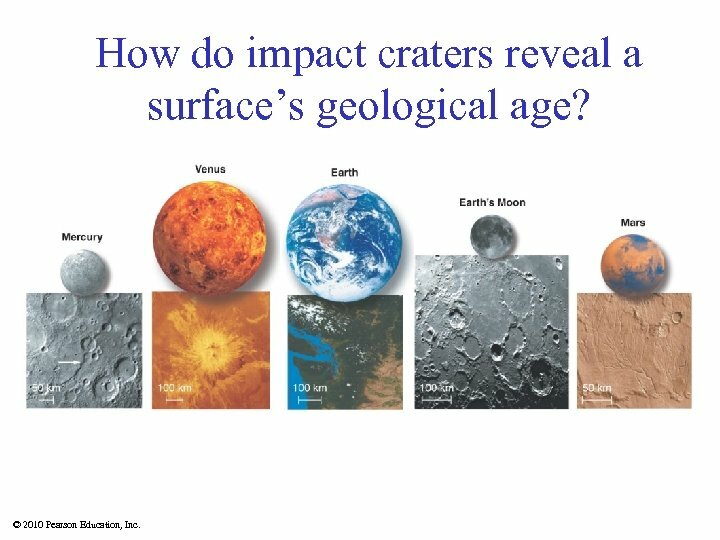 • How do impact craters reveal a surface’s geological age? 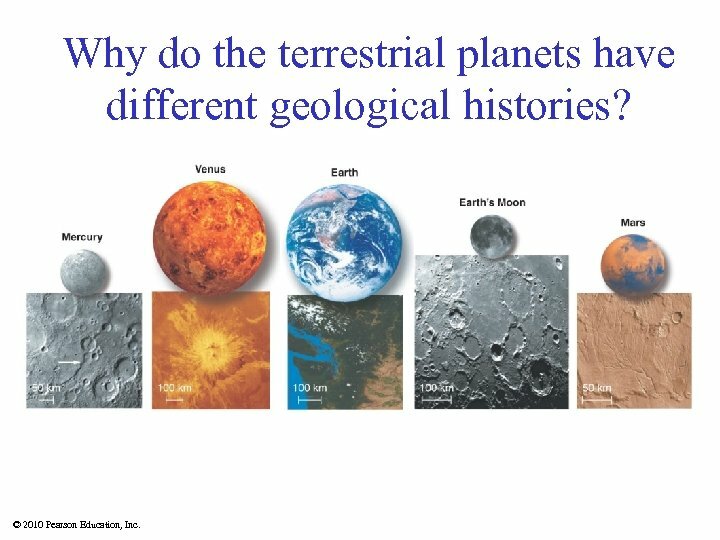 • Why do the terrestrial planets have different geological histories? © 2010 Pearson Education, Inc.
What processes shape planetary surfaces? © 2010 Pearson Education, Inc. 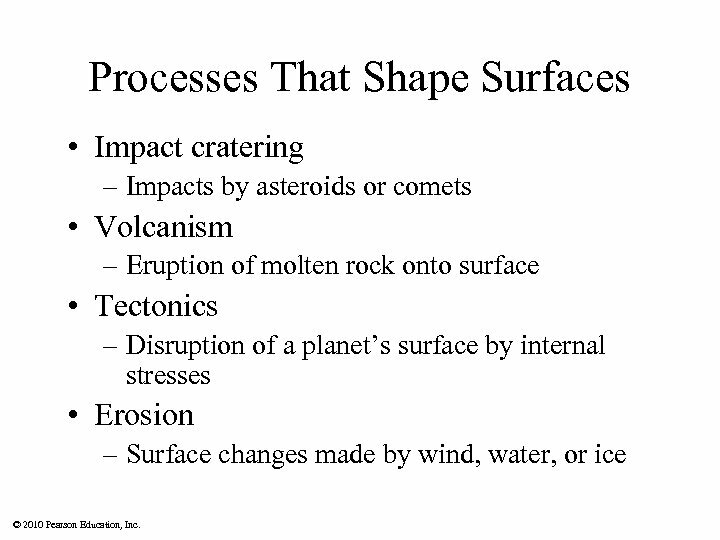 Processes That Shape Surfaces • Impact cratering – Impacts by asteroids or comets • Volcanism – Eruption of molten rock onto surface • Tectonics – Disruption of a planet’s surface by internal stresses • Erosion – Surface changes made by wind, water, or ice © 2010 Pearson Education, Inc.
Impact Cratering • Most cratering happened soon after the solar system formed. 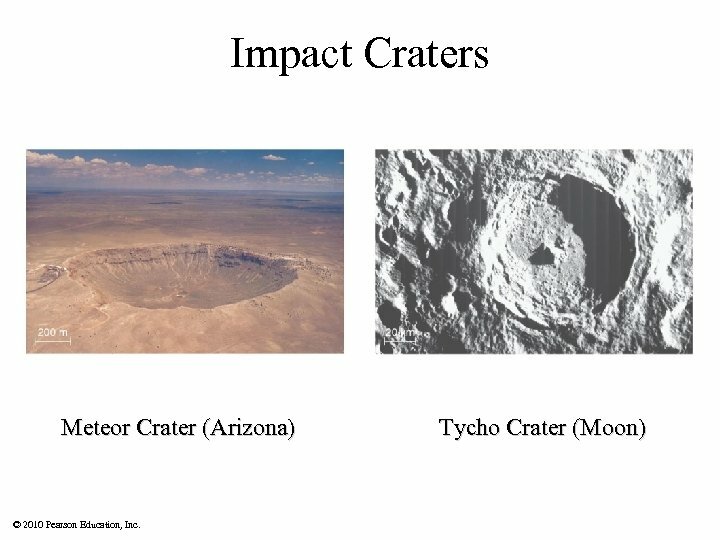 • Craters are about 10 times wider than object that made them. 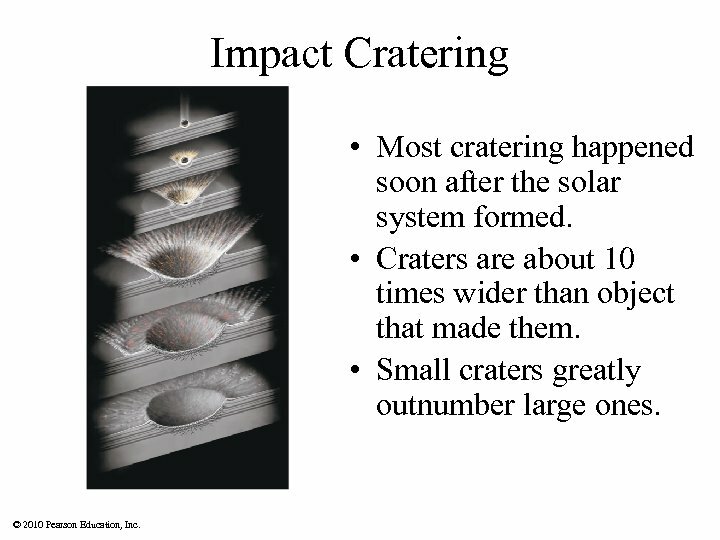 • Small craters greatly outnumber large ones. 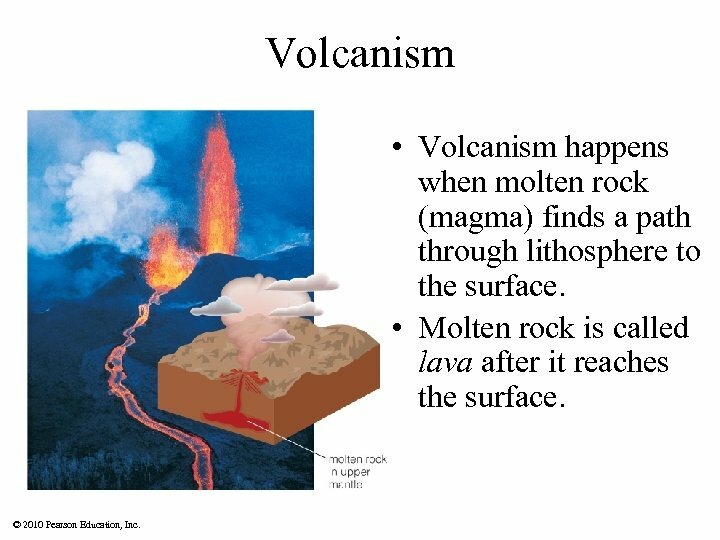 © 2010 Pearson Education, Inc.
Volcanism • Volcanism happens when molten rock (magma) finds a path through lithosphere to the surface. • Molten rock is called lava after it reaches the surface. © 2010 Pearson Education, Inc.
Lava and Volcanoes Runny lava makes flat lava plains. 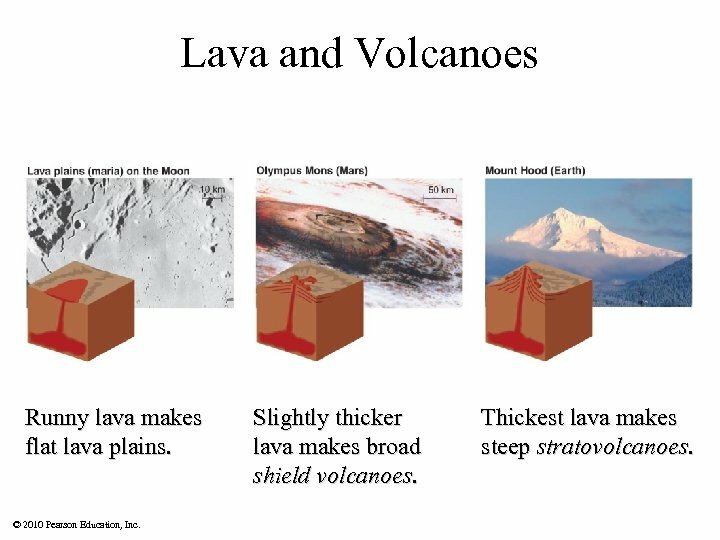 © 2010 Pearson Education, Inc. Slightly thicker lava makes broad shield volcanoes. Thickest lava makes steep stratovolcanoes. 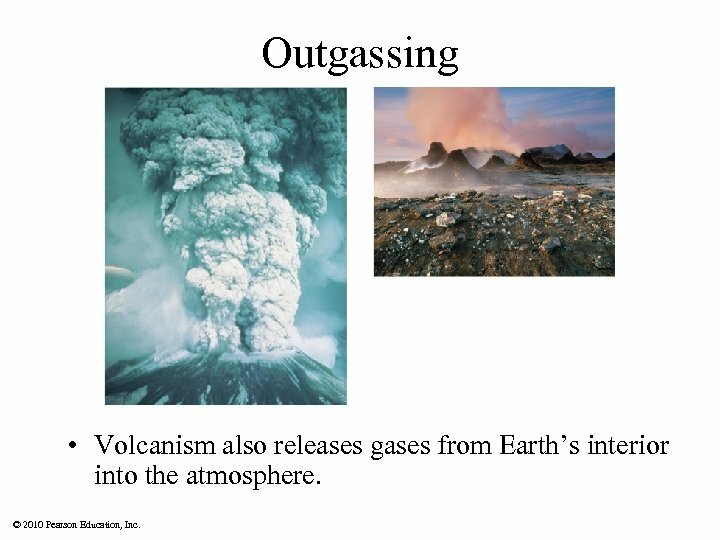 Outgassing • Volcanism also releases gases from Earth’s interior into the atmosphere. 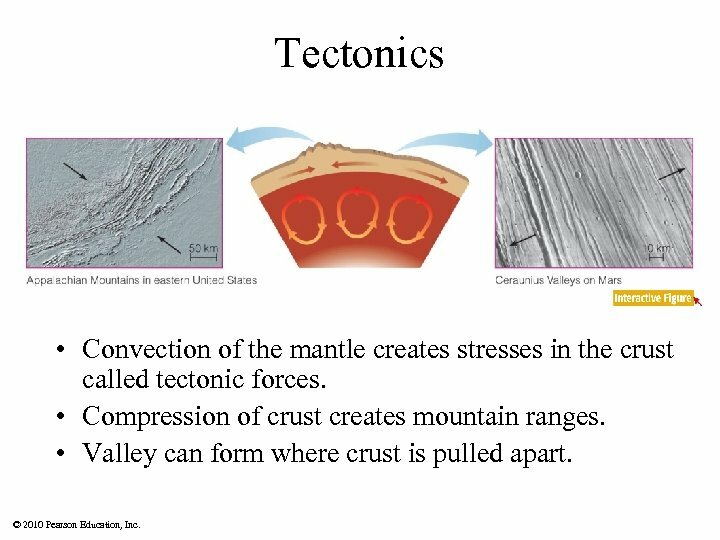 © 2010 Pearson Education, Inc.
Tectonics • Convection of the mantle creates stresses in the crust called tectonic forces. • Compression of crust creates mountain ranges. • Valley can form where crust is pulled apart. © 2010 Pearson Education, Inc. 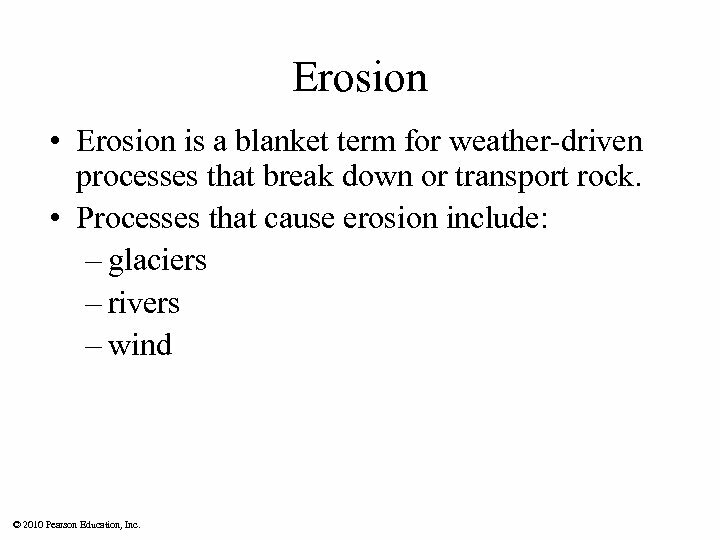 Erosion • Erosion is a blanket term for weather-driven processes that break down or transport rock. 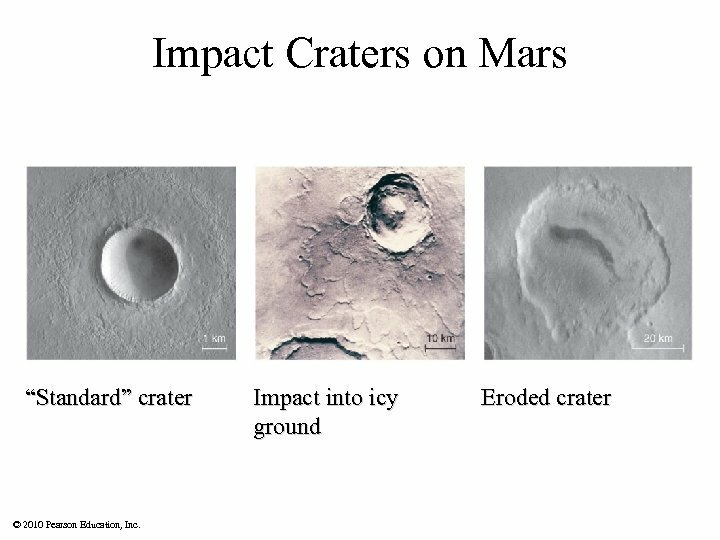 • Processes that cause erosion include: – glaciers – rivers – wind © 2010 Pearson Education, Inc.
How do impact craters reveal a surface’s geological age? 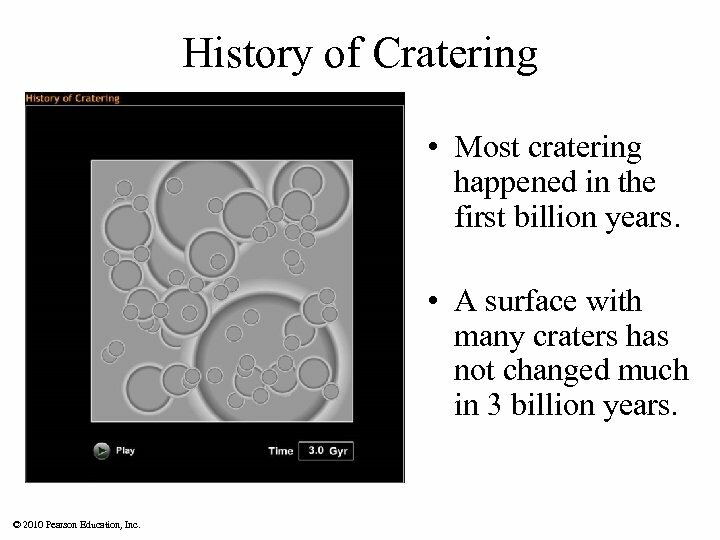 © 2010 Pearson Education, Inc.
History of Cratering • Most cratering happened in the first billion years. • A surface with many craters has not changed much in 3 billion years. 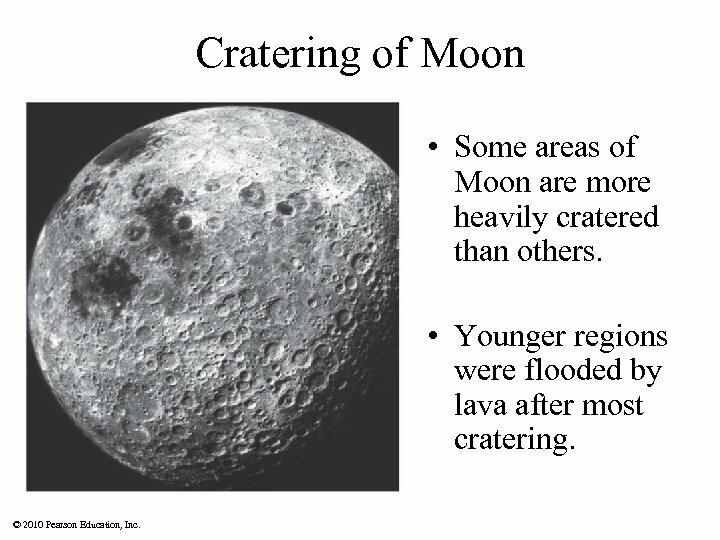 © 2010 Pearson Education, Inc.
Cratering of Moon • Some areas of Moon are more heavily cratered than others. • Younger regions were flooded by lava after most cratering. 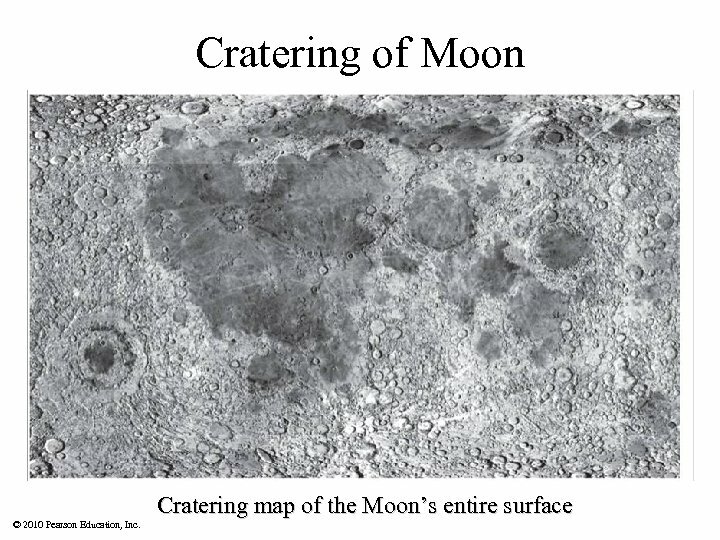 © 2010 Pearson Education, Inc.
Cratering of Moon Cratering map of the Moon’s entire surface © 2010 Pearson Education, Inc.
Why do the terrestrial planets have different geological histories? 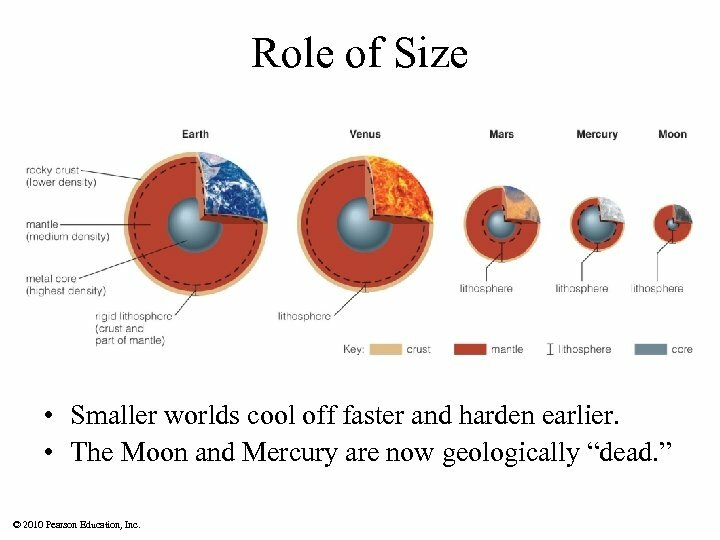 © 2010 Pearson Education, Inc.
Role of Planetary Size • Smaller worlds cool off faster and harden earlier. 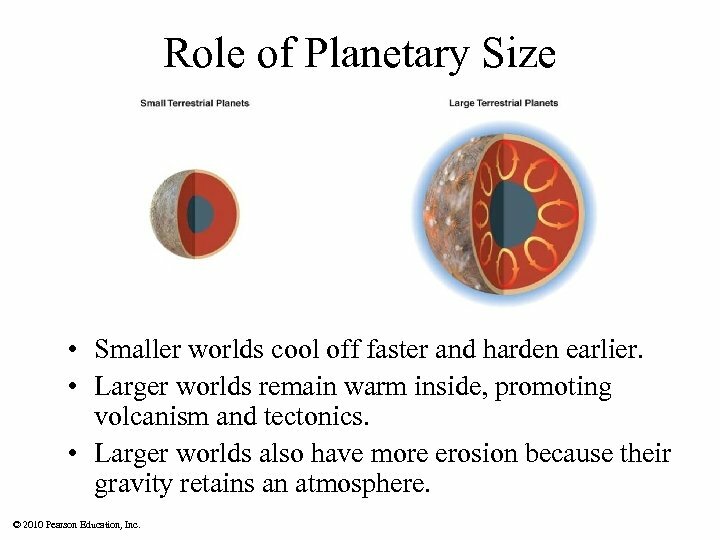 • Larger worlds remain warm inside, promoting volcanism and tectonics. • Larger worlds also have more erosion because their gravity retains an atmosphere. 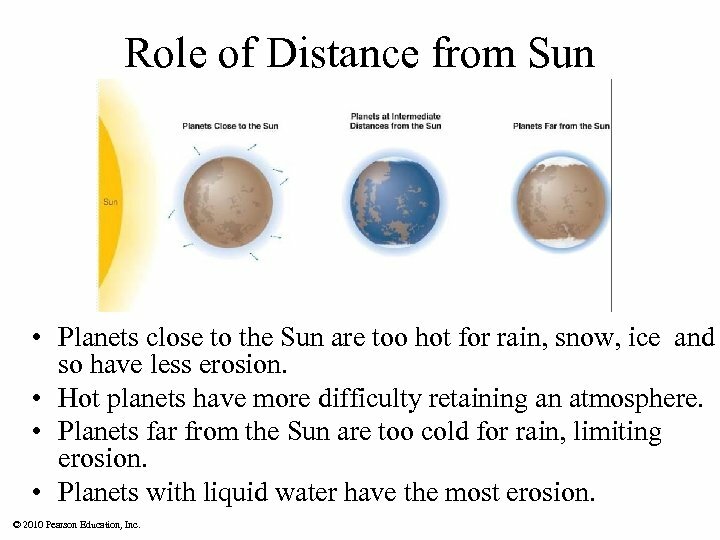 © 2010 Pearson Education, Inc.
Role of Distance from Sun • Planets close to the Sun are too hot for rain, snow, ice and so have less erosion. • Hot planets have more difficulty retaining an atmosphere. • Planets far from the Sun are too cold for rain, limiting erosion. • Planets with liquid water have the most erosion. 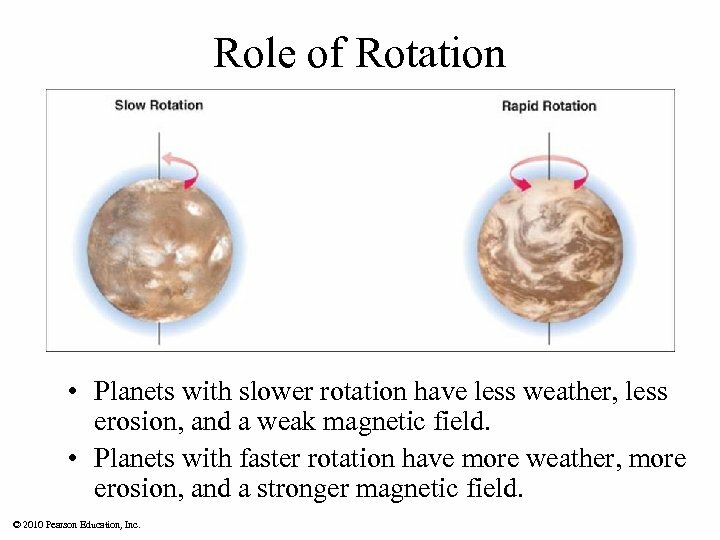 © 2010 Pearson Education, Inc.
Role of Rotation • Planets with slower rotation have less weather, less erosion, and a weak magnetic field. • Planets with faster rotation have more weather, more erosion, and a stronger magnetic field. © 2010 Pearson Education, Inc.
9. 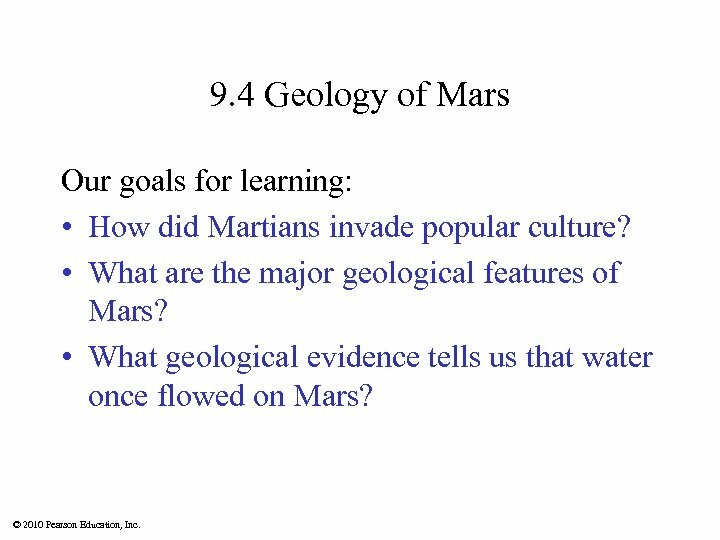 4 Geology of Mars Our goals for learning: • How did Martians invade popular culture? • What are the major geological features of Mars? 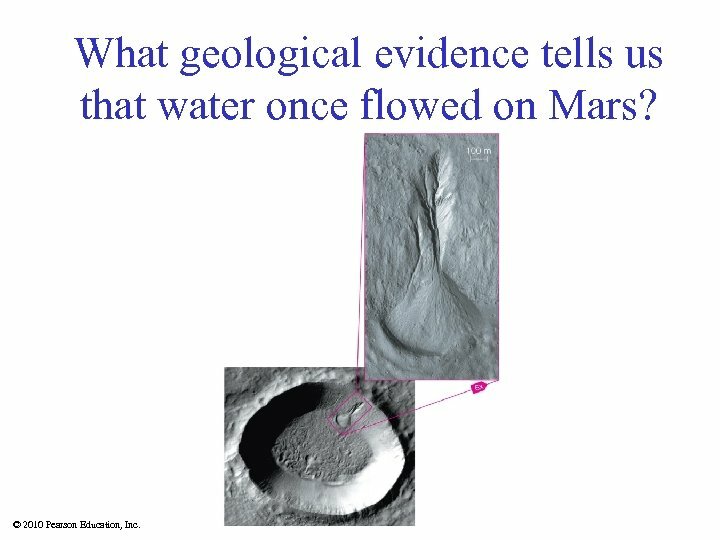 • What geological evidence tells us that water once flowed on Mars? 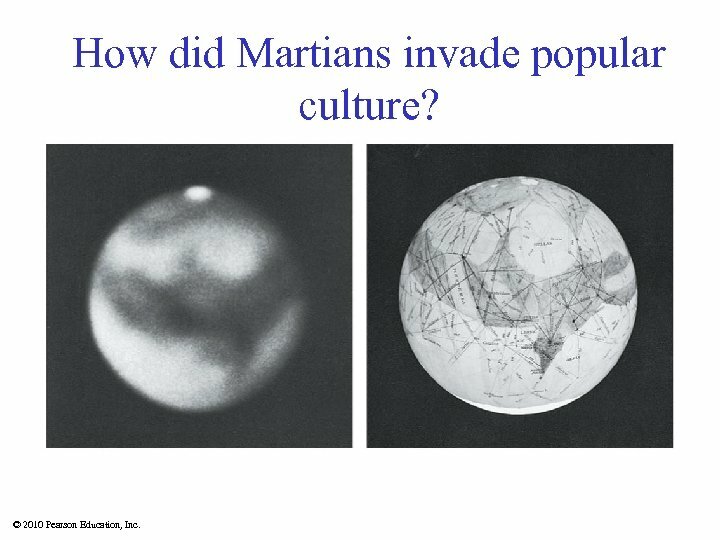 © 2010 Pearson Education, Inc.
How did Martians invade popular culture? 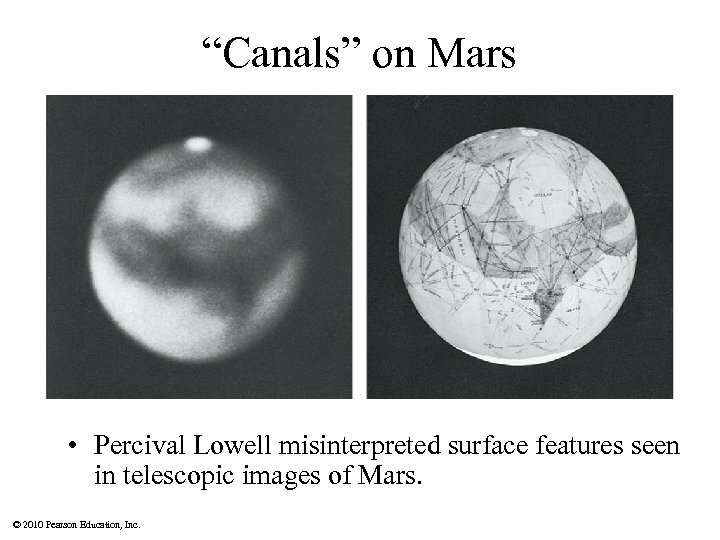 © 2010 Pearson Education, Inc.
“Canals” on Mars • Percival Lowell misinterpreted surface features seen in telescopic images of Mars. 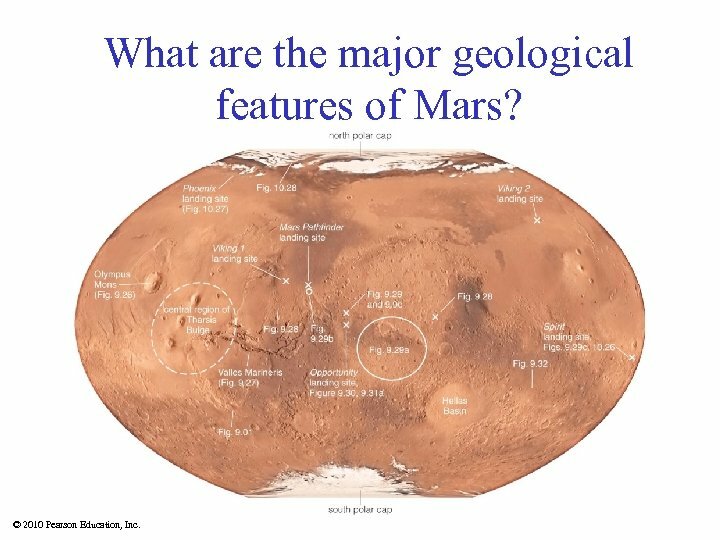 © 2010 Pearson Education, Inc.
What are the major geological features of Mars? © 2010 Pearson Education, Inc.
Volcanism on Mars • Mars has many large shield volcanoes. 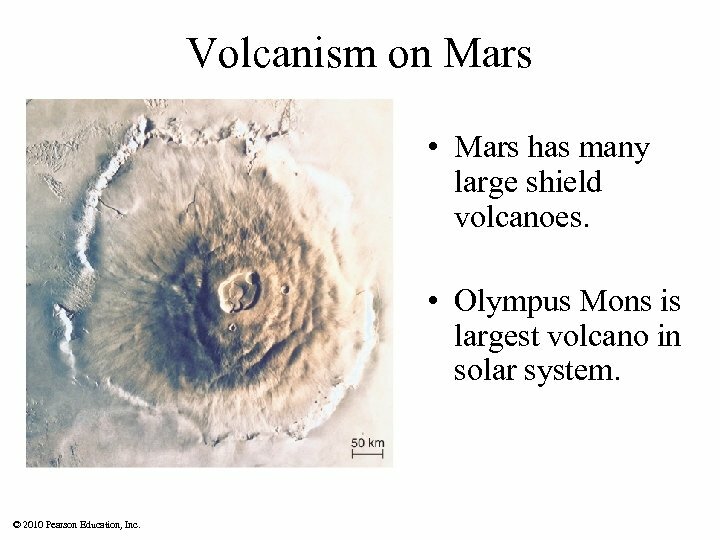 • Olympus Mons is largest volcano in solar system. © 2010 Pearson Education, Inc.
What geological evidence tells us that water once flowed on Mars? 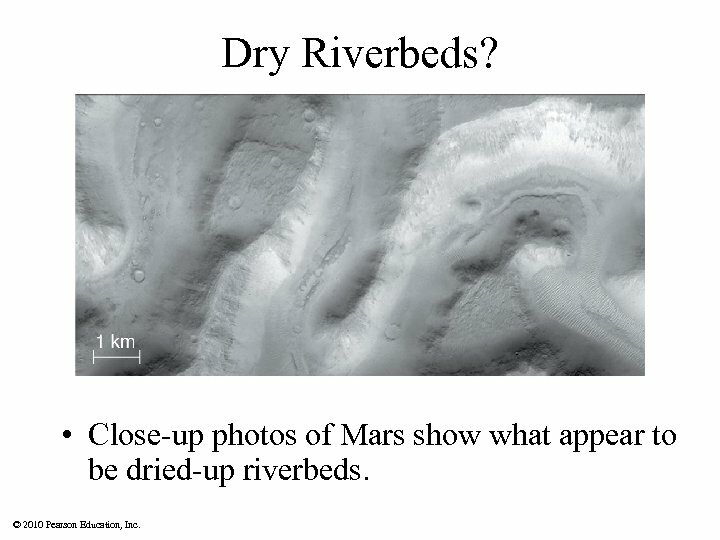 © 2010 Pearson Education, Inc.
Dry Riverbeds? • Close-up photos of Mars show what appear to be dried-up riverbeds. © 2010 Pearson Education, Inc. 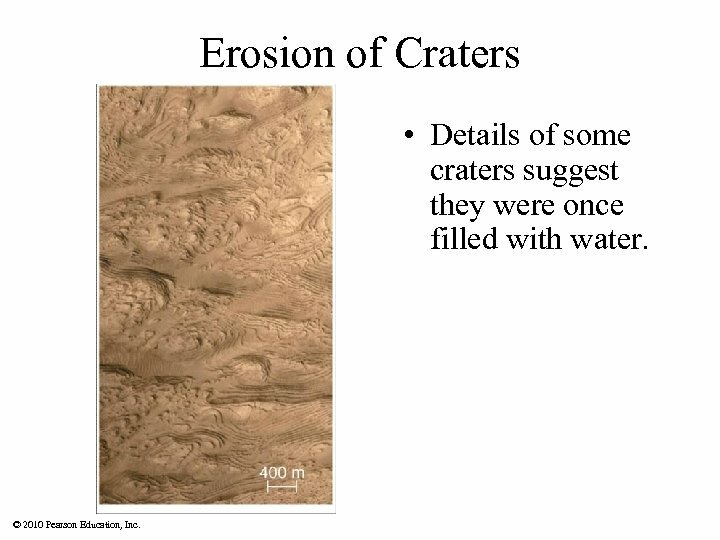 Erosion of Craters • Details of some craters suggest they were once filled with water. 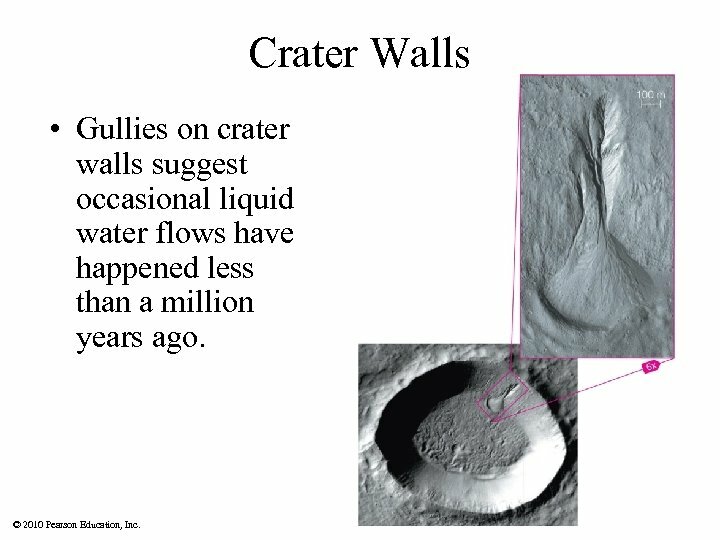 © 2010 Pearson Education, Inc.
Crater Walls • Gullies on crater walls suggest occasional liquid water flows have happened less than a million years ago. © 2010 Pearson Education, Inc.
9. 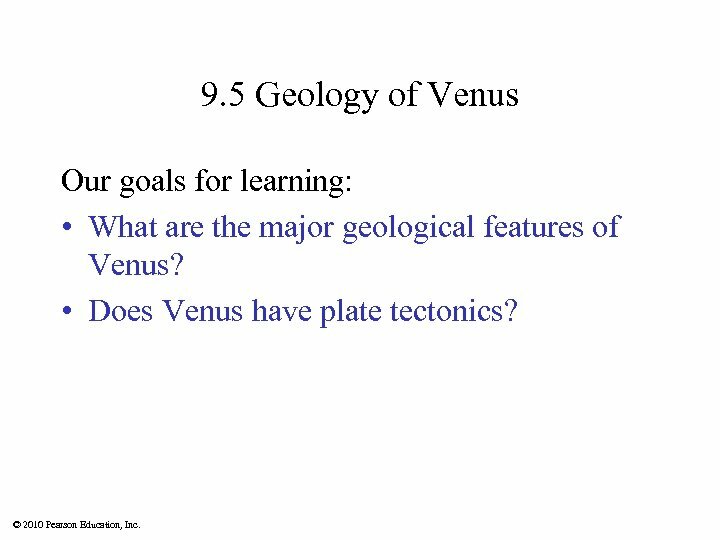 5 Geology of Venus Our goals for learning: • What are the major geological features of Venus? 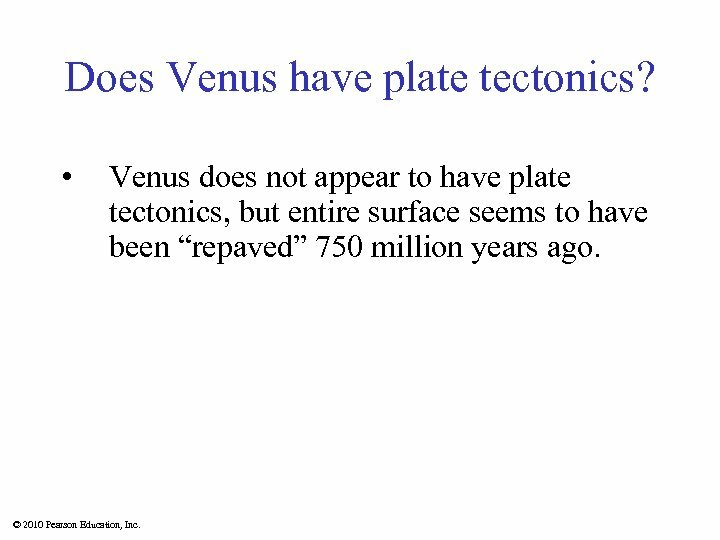 • Does Venus have plate tectonics? 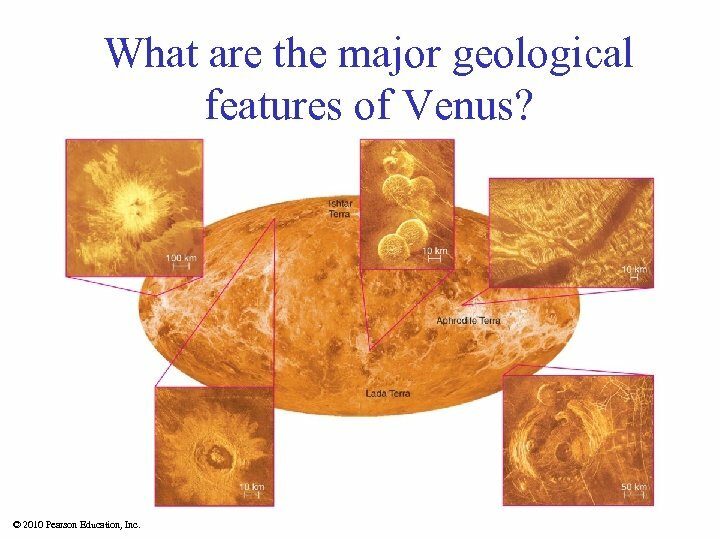 © 2010 Pearson Education, Inc.
What are the major geological features of Venus? 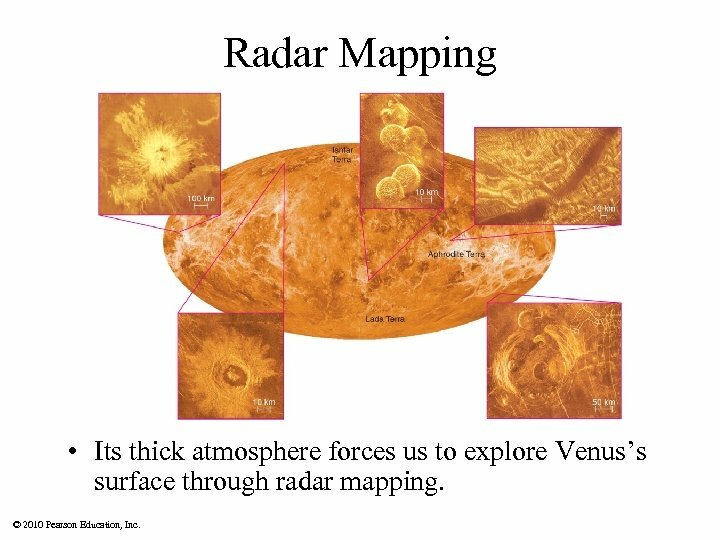 © 2010 Pearson Education, Inc.
Radar Mapping • Its thick atmosphere forces us to explore Venus’s surface through radar mapping. 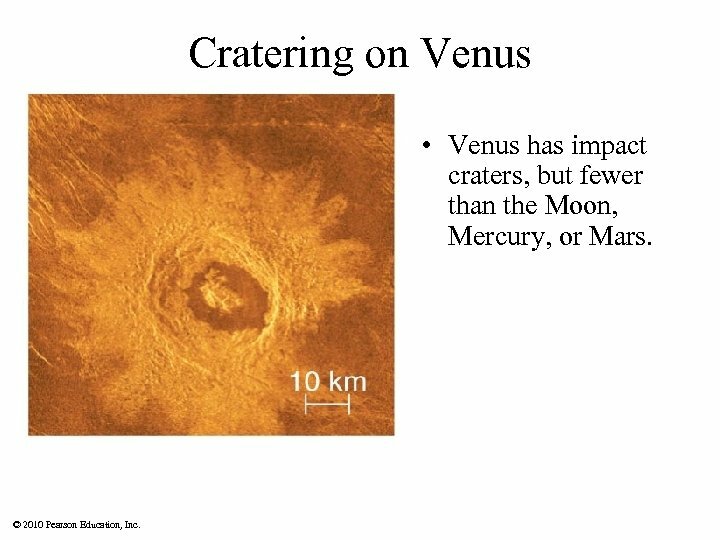 © 2010 Pearson Education, Inc.
Cratering on Venus • Venus has impact craters, but fewer than the Moon, Mercury, or Mars. 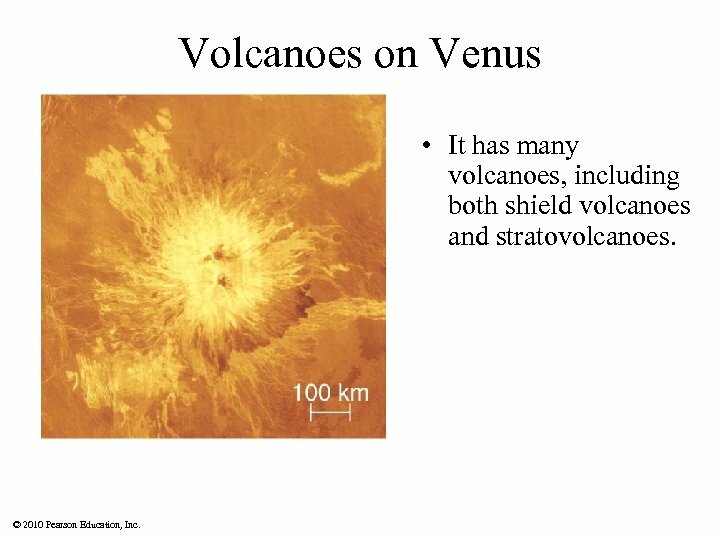 © 2010 Pearson Education, Inc.
Volcanoes on Venus • It has many volcanoes, including both shield volcanoes and stratovolcanoes. © 2010 Pearson Education, Inc. 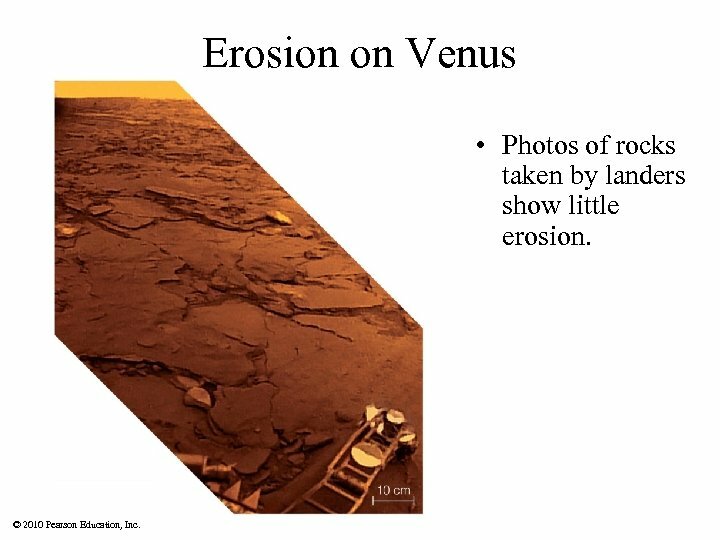 Erosion on Venus • Photos of rocks taken by landers show little erosion. © 2010 Pearson Education, Inc. Does Venus have plate tectonics? • Venus does not appear to have plate tectonics, but entire surface seems to have been “repaved” 750 million years ago. © 2010 Pearson Education, Inc.
9. 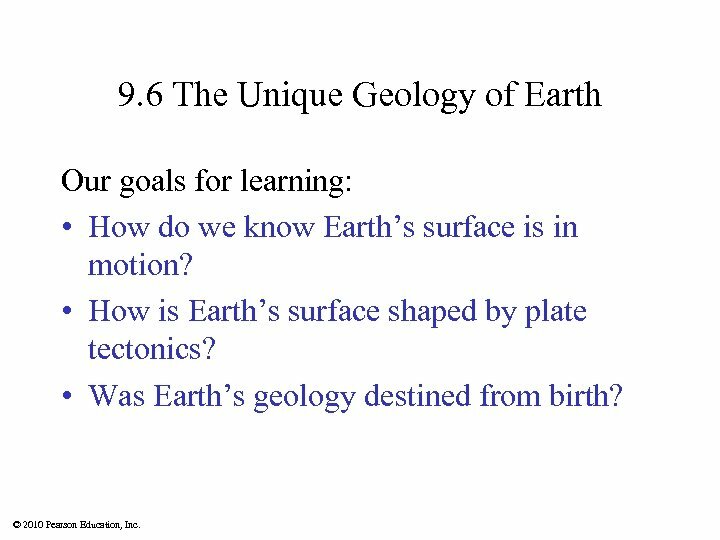 6 The Unique Geology of Earth Our goals for learning: • How do we know Earth’s surface is in motion? • How is Earth’s surface shaped by plate tectonics? • Was Earth’s geology destined from birth? 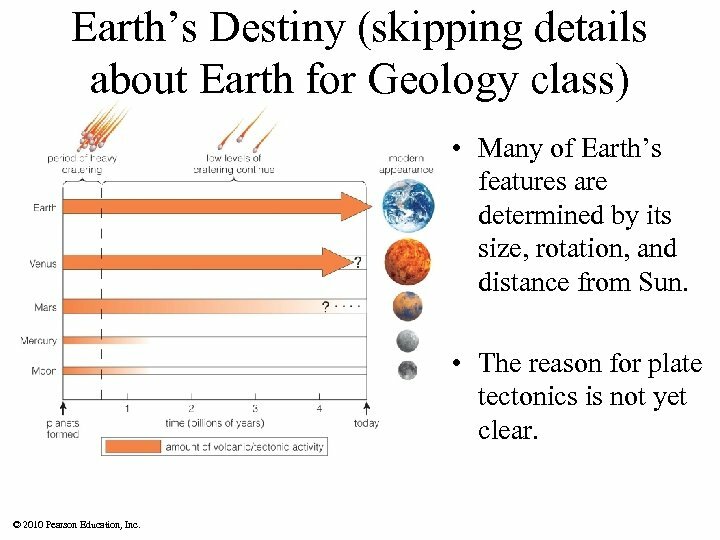 © 2010 Pearson Education, Inc.
Earth’s Destiny (skipping details about Earth for Geology class) • Many of Earth’s features are determined by its size, rotation, and distance from Sun. • The reason for plate tectonics is not yet clear. © 2010 Pearson Education, Inc.